A vintage luxury sports machine, the Ariel Square Four had, as the name suggests, four whole cylinders at a time when most motorcycles of the period had just one or two. Automobile components can get away with being heavy, but over-engineered solutions in a motorcycle application mean significantly reduced performance and, for years, four-cylinder engines weren’t compatible with twin demands of light weight and reliability. Inline fours can be tricky to package into a motorcycle, particularly when configured longitudinally, as was common before the Honda CB750. But the Ariel uses an interesting “square” format that features a pair of parallel twins, complete with a crankshaft for each. Not only did this solution offer up the power and smoothness of an inline four, the very compact design meant it could be squeezed into existing frames meant to house a parallel twin. 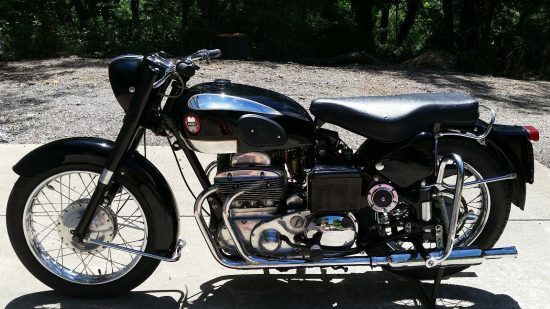 No surprise, as the design was originally intended for BSA. The first generation of Square Four displaced 500cc with a bump to 601 for increased torque, so riders using the bike as practical transport could more easily drag the weight of a sidecar around. 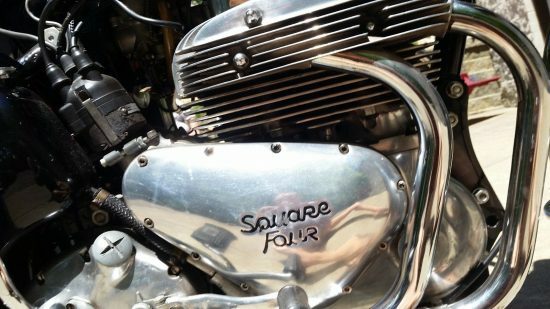 That early overhead cam design had issues with overheating, as the square four configuration naturally has a hard time getting cooling air to the rear pair of cylinders. Suzuki’s later RG500 engine used liquid-cooling to get around this problem, but that was obviously not an option here. 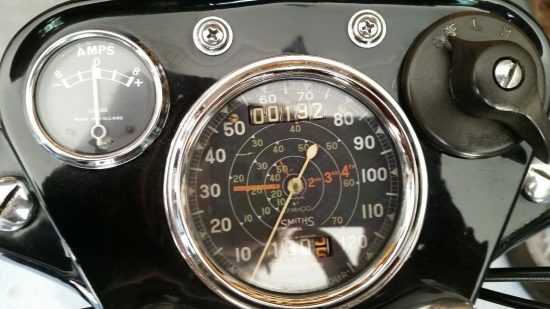 The engine saw a complete overhaul in 1937 with a shift from overhead cams to cam-in-block and pushrods, but a big jump in displacement to 997cc. 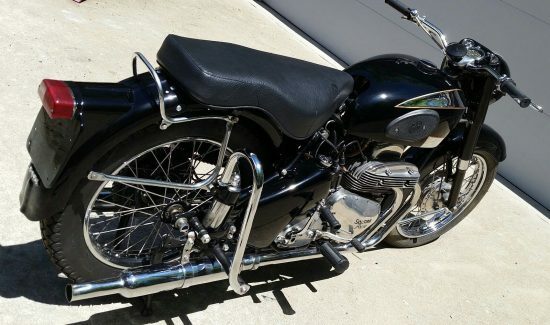 In 1949, the iron head became aluminum for a huge savings in weight and the version seen here is the final iteration, with four individual exhaust pipes, instead of the earlier pair of siamesed parts that make the bike look like it’s powered by a bulky parallel twin. 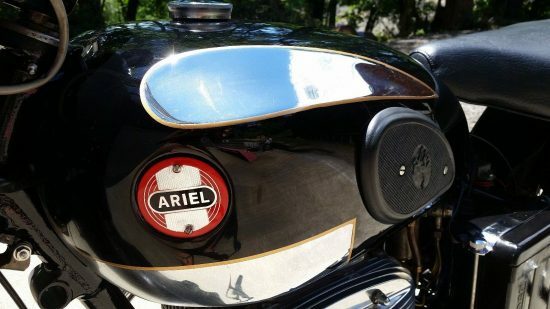 Up for sale is a restored Ariel Sq4 This bike was completely restored 10 years ago and sat in a collection for 5 years. I bought it and meet the person who restored it in Mass. He is good at what he does and the bike still shows very well. All the miles were put on by me, last being a 50 mile ride 2 years ago. The bike has been started and ran in the last few months. It will start right up and operate very smooth. There are no known problems. The restoration was both mechanical and cosmetic at the time. Buyer will be responsible for transportation from Pgh PA.
I’m assuming “Pgh” is Pittsburgh in this case. There’s very little time on this auction, with bidding up just north of $16,000 and the reserve not yet met. So what’ll she do, mister? Well that nearly full liter of displacement gave 45hp and the bike weighed a surprisingly svelte 425lbs, so the Square Four could very nearly “do the ton.” But while bikes like the BSA Gold Star were about ultimate performance, the Square Four was about the way in which it delivered that performance, and the smooth relaxed power and sophistication was really in a class by itself from the bike’s introduction in 1931 until it was discontinued in 1959, a remarkable production run for any motorcycle. 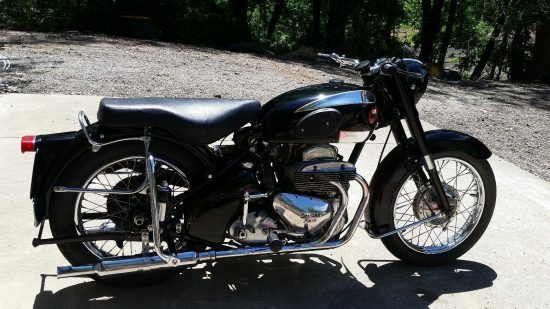 Yet another example of how the British were so far ahead of other motorcycle manufacturers in the world during the 40’s and 50’s, yet sadly to disappear in the mid to late 70’s. Very true. But at least Triumph has made a very serious comeback of late! I wish there were room in today’s market for a mass-produced Norton and a small range of Laverdas.